PALLZA pallets are an innovative group of products 100% ecological, applicable wherever wooden pallets do not work due to their properties. By performing a basic transport function, they bring savings in the supply chain due to their low weight, which in practice leads to a reduction in the weight of the load, and thus a reduction in fuel consumption. The use of Pallza pallets primarily significantly affects the protection of the environment through the use of recycled paper for seven times for reprocessing. 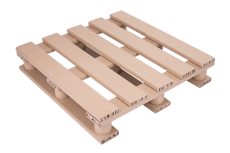 The PALLZA pallet is lighter than the standard wooden pallet by about 20 kg. The use of a special construction combining different types of paper eliminates the need for fumigation certification, unlike wooden pallets. 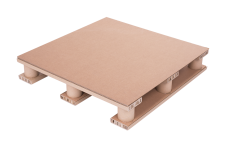 The special design of PALLZA pallets eliminates the risk of damage to products by protruding nails used in standard wooden pallets. Possibility to adjust the dimensions and strength parameters of the pallet to the specificity of the load. 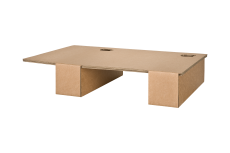 Low weight eliminates the risk of back injuries and allows you to limit the use of forklifts to manipulate empty pallets.